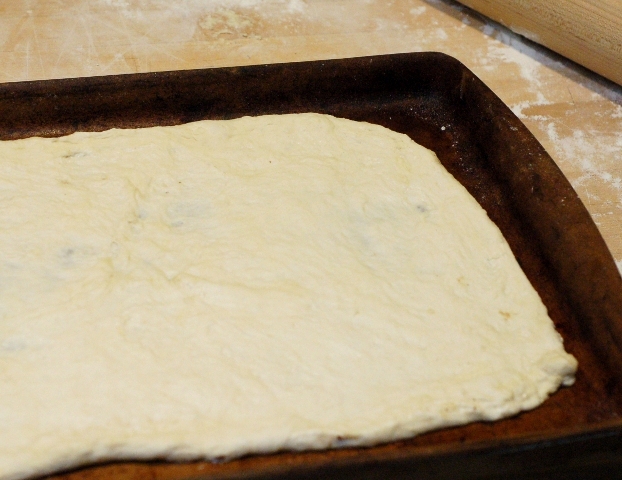 There's a learning curve to making homemade pizza, don't you think? 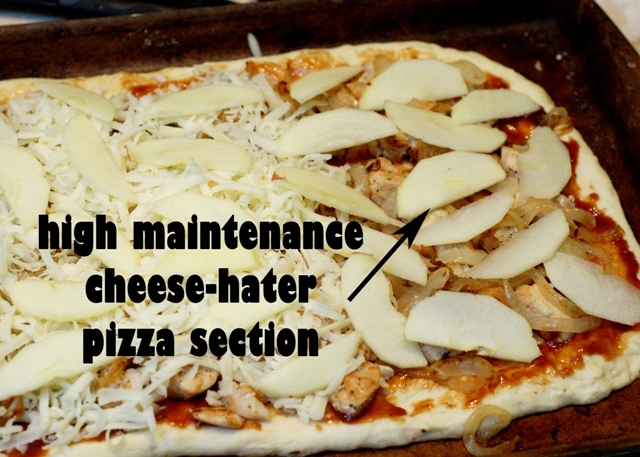 The dough might not turn out, or you cook it and the middle is soggy... nobody likes feeling like a pizza failure! I've finally found a no-fail recipe for a dough that I love, and now my family has homemade pizza almost every week - and that's quite an accomplishment, considering my husband hates cheese of all sorts and varieties. Weirdo. Anyway, I thought I'd share the recipe, because I'm the sharing sort. I make my pizza dough in the breadmaker -- I start it in the afternoon and it's ready to go for dinnertime. Love it. 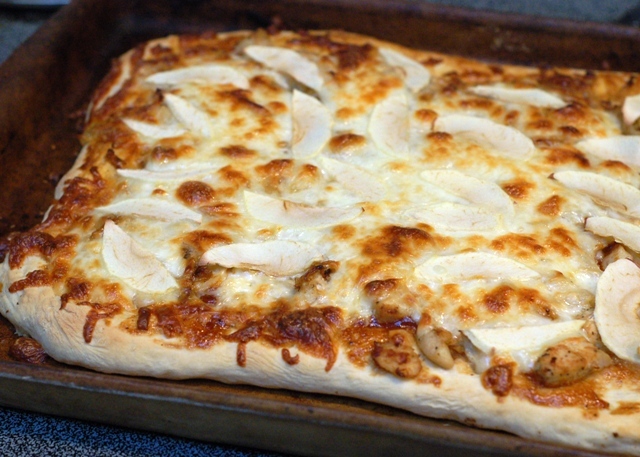 This week, I made BBQ/onion/apple pizza and it was delicious. My husband was a bit skeptical but he was pleasantly surprised. Start by spreading your dough on a stone or a pan -- I no longer have a fancy round pizza stone, they keep getting broken mysteriously when someone in my house starts the oven's self-cleaning cycle with a pizza stone inside. This person's name rhymes with "shmy shmusband," but that's the only hint you'll get. 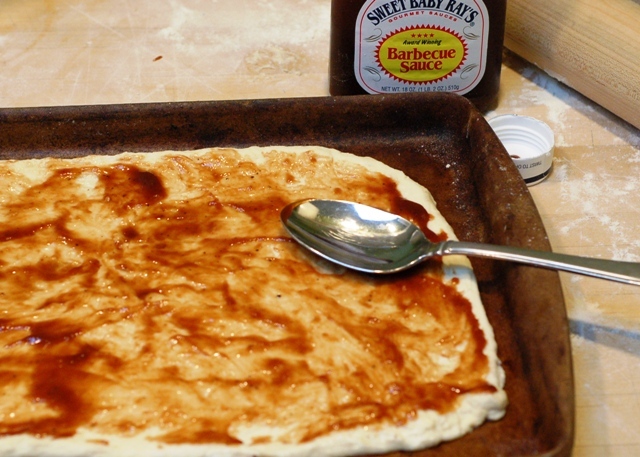 Smear on some barbeque sauce -- whatever sort you love, except for that really inexpensive Kraft stuff. Unless you like it. When I was first married I thought I was being so frugal and amazing buying it, and then I discovered it doesn't taste at all good. Is it just me? Add some cooked chicken and carmelized onions. Ideally, your onions should be more carmelized than mine. I ran out of time. I was packing and trying to get kids to baseball practices, people! If you run out of time, rest assured that partially carmelized onions will still taste good. Lastly, add your mozzarella cheese (grate your own, you'll be glad you did!) and peeled, sliced apples. Throw it in the oven for 16-20 minutes (I keep it in for the full 20) then let it rest for 5-8 minutes more. The resting time is important to avoid floppy fish slices when you pick your pizza up. Then it's time to enjoy! Put all ingredients into bread machine, select the "dough" setting and start. When it's done rising, punch it down, shut machine door and let rise a second time for 45 minutes. 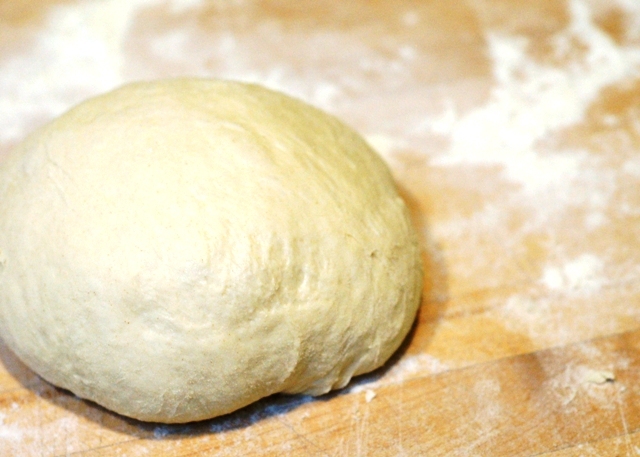 Turn out, and divide into two equally sized dough balls. You can freeze them or use right then. If you're using the dough immediately, form your pizza, top with desired toppings and bake at 425° F for 16-20 minutes until your cheese reaches your desired melty brown-factor. MMMM... looks amazing. Thanks for sharing, I'm gonna have to try this out! I thought my husband was the only person in the world who hated cheese! It's nice to know I'm not alone in cooking for a cheese hater. But seriously I don't understand not liking cheese. I would eat it every meal if it didn't go straight to my hips (and arteries)! Now I'm giggling AND hungry. And it only 8:56 am where I live. 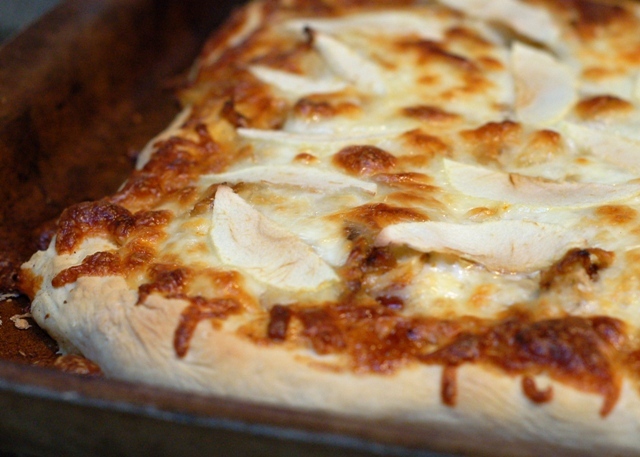 Mmm, I actually made a very similar pizza for lunch today...slightly different dough recipe, and used pineapple instead of apple. Delicious! This sounds absolutely delicious!!! Great job!! This post makes me laugh. My grandmother hated cheese (she would even wash your dish if it had cheese residue on it). The pizza parlour would always call us back after we would order her pizza without cheese; just sausage and tomato sauce. They thought it was a hoax. The recipe sound similar to mine for the crust. I also use breadmaker. I cannot wait to try these toppings. Apples...Yum. Opps...grandma wouldn't even wash your dish..., etc. not would. Hi Anna, I'm visiting by way of the linky party at "Just a Girl". Your recipe caught my eye...and didn't disappoint. What a fabulous pizza! 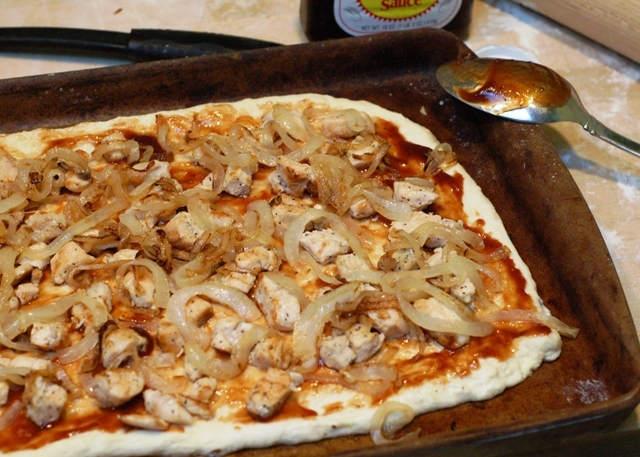 Homemade pizza is the best, and your combination of toppings is one I look forward to trying! pizza is awesome.My brother loves it very much. in other words he is mad for it.i will surely prepare i for him.